This is the building from which I drew the River Thames - see Storm clouds over Westminster. I was in the room on the fourth floor (in the roof) on the left hand side. This used to be JM Barrie's sitting room and study and which has a magnificent view of the Thames. 3 Robert Street is an original part of the Adelphi Terrace development designed and built between 1768 & 1774 on the banks of the Thames by the Adams Brothers led by Robert Adam. 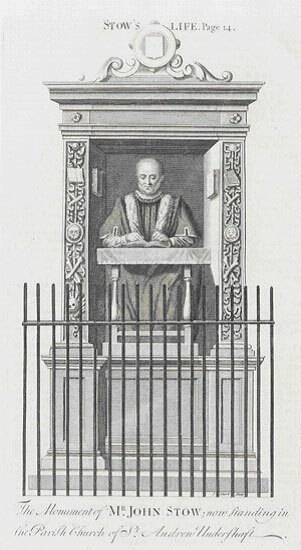 Robert Street is in fact named after Robert Adam. 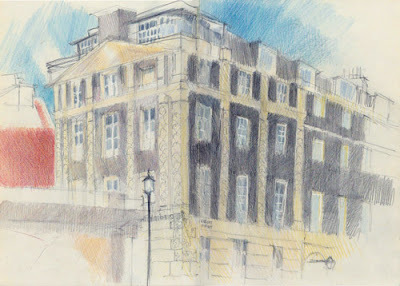 It's a listed building - and one I used to work in around about 20 years ago. 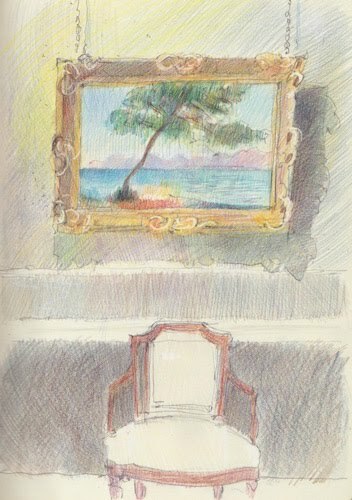 When designing the Adelphi, Robert Adam was reputedly influenced by a visit he made to the ruins of the palace of the Emperor Diocletian at Spalatro in Dalmatia. The link is to a digitzed version of the book he compiled as a result. I had been trying to get all four floors plus a bit of pavement in - but ran out of space so the ground floor has been chopped off. I find it much more difficult when having to look up at a building (and down and up and down and up) to judge distances! Somehow it's a lot easier when you're looking straight ahead! 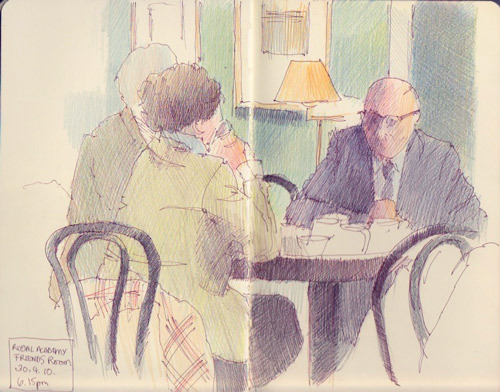 My Drawing Group's latest expedition to draw London found us at the Victoria Embankment next to Charing Cross Station at the end of May. It's an area I know extremely well and I've paced up and down it a few times trying to work out where Monet painted Parliament from. 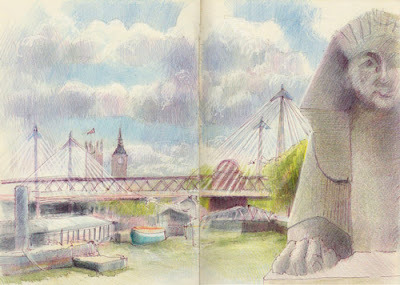 To draw this I was sat at the base of Cleopatra's Needle - which has a ledge which is just big enough to park a posterior. The "A" marks the spot on this Google Map of the location of Cleopatra's Needle. There's a terrace just below Cleopatra's Needle - but don't sit there if the tide is coming in as it comes all the way up the steps and floods the terrace. A fellow sketcher had to move up the steps which come up from that terrace to the Embankment due to splashing from the wash of passing boats! Cleopatra's Needle is a granite obelisk and was presented to the United Kingdom in 1819 by the ruler of Egypt and the Sudan in commemoration of the victories of Lord Nelson at the Battle of the Nil. There are two other needles in New York and Paris. It is 68½ feet high, and weighs 180 tons. Below is a description of the pair of Cleopatra's Needles in London and New York. The pair are made of red granite, stand about 21 metres (68 ft) high, weigh about 224 tons and are inscribed with Egyptian hieroglyphs. They were originally erected in the Egyptian city of Heliopolis on the orders of Thutmose III, around 1450 BC. The material of which they were cut is granite, brought from the quarries of Aswan, near the first cataract of the Nile. The inscriptions were added about 200 years later by Ramesses II to commemorate his military victories. The obelisks were moved to Alexandria and set up in the Caesareum — a temple built by Cleopatra in honor of Mark Antony — by the Romans in 12 BC, during the reign of Augustus, but were toppled some time later. This had the fortuitous effect of burying their faces and so preserving most of the hieroglyphs from the effects of weathering. 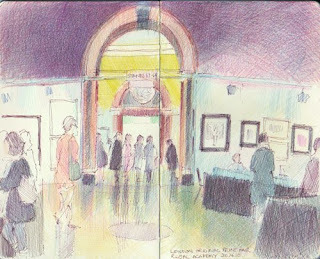 You can see more of my sketches of London on the Travels with my Sketchbook in London page on my website. 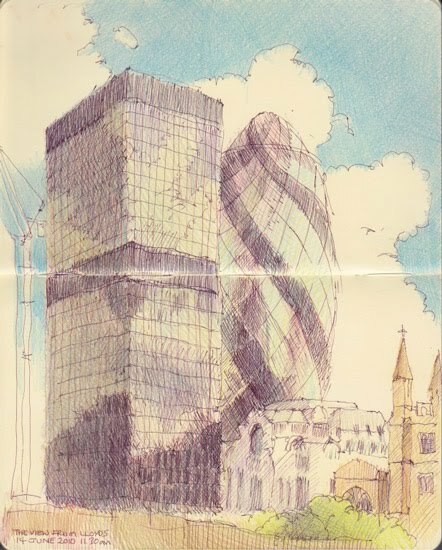 London Sketchbook is a summary of all the blog posts about sketching in London. I haven't been posting a lot of late - and it's not that I haven't been sketching but rather that I haven't been scanning my sketches! Lots of things to do meant some activities had to take a place in the queue and get done if I had the time. So now having completely omitted to post in May, I'm on catchup! I spent a very interesting afternoon back in April at the 25th London Original Print Fair at the Royal Academy of Arts. 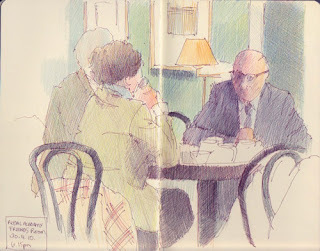 No scope for photographs - but I did sketch in the exhibition halls and - as per usual - in the Friends Room where I enjoyed my cup of tea and had a nice sit down on one of the sofas after wending my way round the very many stands.